Thursday June 28th 1883 I ironed some before breakfast and then went up in the garret to straighten things about. Bridget mopped the floor and washed out some calico things Mother went to town right away after dinner she brought Edith home with her and Lee and I took her back. John was just ready to take the folks a ride and I went along. I stopped there for supper when I came back and did not get home till nearly night. 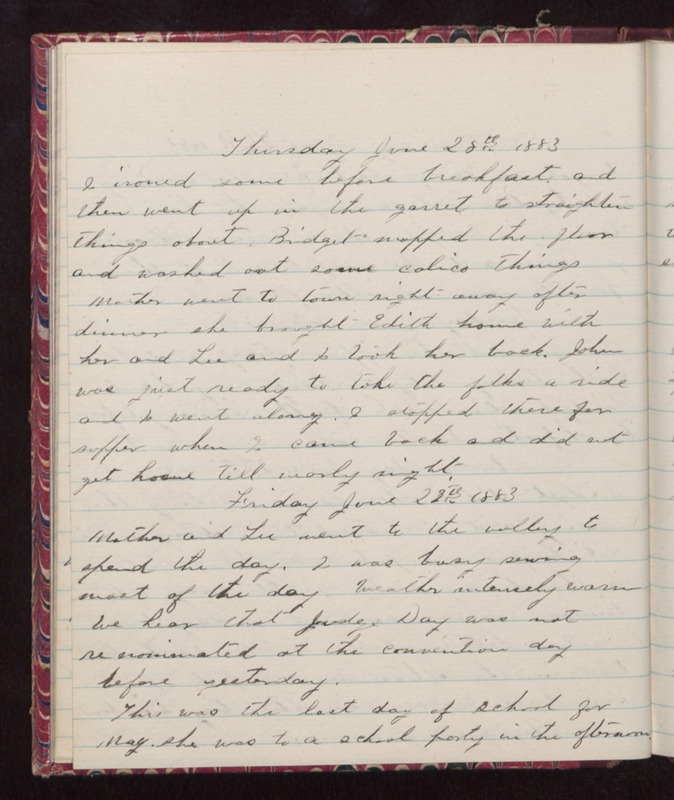 Friday June 29th 1883 Mother and Lee went to the valley to spend the day. I was busy sewing most of the day. Weather intensely warm. We hear that Judge Day was not renominated at the convention day before yesterday. This was the last day of school for May, she was to a school party in the afternoon.